A large proportion of women in the WHO European Region drink alcohol. As approximately half of all pregnancies are unplanned, the exposure of fetuses to alcohol is a public health concern. International research has shown that between 6% (Sweden) and 82% (Ireland) of pregnant women continue to drink alcohol, despite the fact that there is no known safe limit for drinking during pregnancy. Alcohol consumption during pregnancy increases the risk for miscarriage and low birth weight, and can interfere with the developmental processes of the fetus in ways that lead to brain damage and physical abnormalities. 9 September is International Fetal Alcohol Spectrum Disorders (FASD) Awareness Day, which focuses on bringing attention to the harm caused to the developing baby from alcohol exposure during pregnancy. Raising awareness, providing advice and ensuring that pathways to treatment are available are important aspects of preventing FASD through health services. A new publication from WHO/Europe, “Prevention of harm caused by alcohol exposure in pregnancy: rapid review and case studies from Member States”, presents examples of such activities. Several countries have enhanced their health care systems by providing clinical guidelines for identifying alcohol use in pregnancy as well as appropriate treatment to help pregnant women reduce or stop drinking. Others have focused on ensuring that individuals affected by FASD, and their families, access sufficient support. 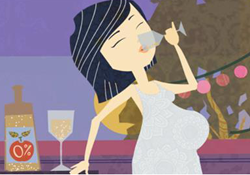 Norway ran the nationwide campaign “Alcohol-free pregnancy” for several years. The campaign’s message was disseminated widely through leaflets, posters, a short film broadcast in cinemas and on television, and advertisements in magazines, newspapers and on Google. The campaign aimed to increase awareness in the general public and also to provide information to health professionals. Through contact with journalists and medical experts, the campaign saw many articles published in the media. It received several awards in global competitions, and data from general population surveys showed some subsequent changes in attitudes towards drinking in pregnancy. The hope is that sharing these good examples will inspire future FASD prevention in the Region. The new WHO/Europe report was produced with funding from the European Union. The newly developed Action plan for sexual and reproductive health aims to provide quality preconception information and services, including information on the effects of alcohol on health outcomes for pregnant women and infants. Alcohol control is also part of the Action plan for the prevention and control of noncommunicable diseases in the WHO European Region. Delegates from Member States will discuss both action plans at the 66th session of the WHO Regional Committee for Europe on 12–15 September 2016.